New technologies have made installing hardwood flooring and millwork in the hot, humid environment of a bathroom more acceptable these days. Manufacturers are pre-finishing cabinetry and millwork with “Catalyzed Sealers,” a durable, baked-on finish that chemically bonds with the wood to prevent moisture penetration. If you choose to finish on-site, a new generation of “Quick-Curing” finishes is available to withstand moisture and maintain flexibility to accommodate the wood’s natural expansion and contraction. Synthetic resins, plasticizers and other ingredients bond together to form a seal that is impermeable to moisture. These finishes are a good choice in areas where water splashing or spills occur. Moisture-cure urethanes, such as polyurethane, are the hardest and produce a glossy finish that is non-yellowing. 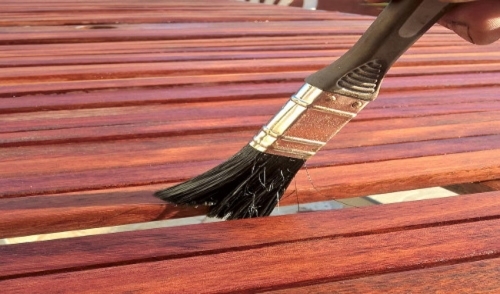 Acid-curing Swedish finishes are more elastic than urethane, non-yellowing and fast-drying; however, they’re the most difficult to apply, as they require a finely sanded surface. Lacquers are hard and water-resistant, but when choosing one it’s important to use a high-quality product that will cure to a flexible film; otherwise it may become brittle and crack or peel.